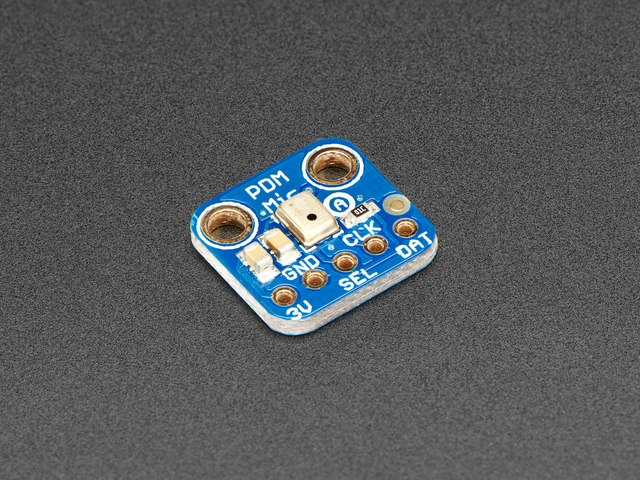 At this time we only have example code for the SAMD21 chipset using the I2S peripheral, you'll be limited to what pins you can use and the digital filtering must be done in software but it does work! We don't necessarily recommend this mic for SAMD21 - an analog microphone will work quite well with less hassle! The SAMD21 can be used with PDM but it's not ideal unless you're willing to put in the work to filter data and manage the peripheral - consider this code for test & experimentation! Download the latest version of the ZeroPDM library from github. Install as usual! We have a two examples, one uses the DMA capability to grab data, which means we don't have to do as much work, but there's more setup involved and requires the ZeroDMA library. We recommend starting with the basic demo, which will echo audio data to A0 (the the analog output). Connect up headphones or an oscilloscope to A0 to hear/see the audio! This guide was first published on Jan 10, 2018. It was last updated on Jan 10, 2018. This page (Wiring & Test) was last updated on Apr 25, 2019.